The WooCommerce API Manager turns WooCommerce Products into an API Resource that can be accessed with an API Key, aka License Key. API Resources (products) are software, a service, an iPhone or Android App, a membership, a subscription, or anything that can be accessed over the Internet. The most frequently used Product types are Simple, Variable, Simple Subscription, Variable Subscription, and Group. Subscription product types are created using the WooCommerce Subscriptions extension. How does it work? The customer buys one or more API Key activations that can used for an API Resource, then uses the API Key to access the API Resource, which is the product or service, and the WooCommerce API Manager controls access to the API Resource for the length of time set for that API Resource. 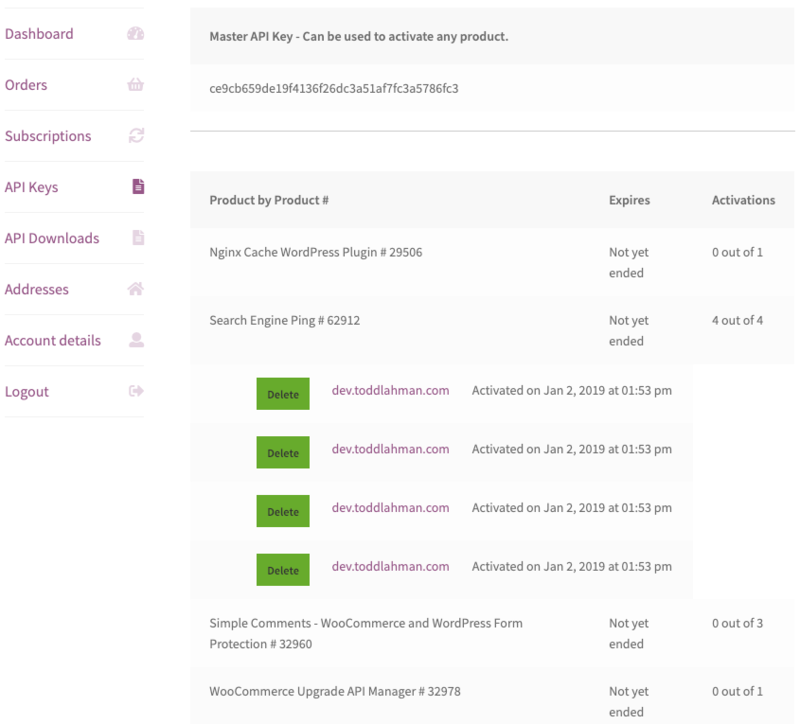 For even more advanced API Resource time management, the WooCommerce API Manager works seamlessly with WooCommerce Subscriptions. The WooCommerce API Manager secures your software with an API Key, by acting as a WooCommerce Software License Manager. When used for software the API Key is exactly like using a License Key, as both provide access to a resource. By using an API Key, client software has a full range of options to activate, deactivate, check the status of an activation, get information about updates, check for updates, and more. All software downloads use secure, expiring, URLs to insure only your customers have secure access to the software that was purchased. Software downloads can come from the WooCommerce store server, Amazon S3, or a remote server. To make selling API Keys for WordPress plugins and themes really easy, after purchasing the WooCommerce API Manager access is granted to a PHP Library, maintained in a private Github repository, that can be dropped into a plugin and theme in less than 5 minutes to be ready for use with the WooCommerce API Manager. There are three types of API Key types that provides a flexible API Key model for any store. Master API Key: Can be used to activate any API Resource purchased with this single API Key. Providing a one-key solution to makes its use easier and more convenient for the customer, which improves satisfaction. Customer access to all API Resources can be turned off by the store owner using the Master API Key if required. Product Order API Key: Can be used to activated a single API Resource from a single order. Can be used for more fine-grained control by the store owner, or by the customer who may choose to allow employees, or a friend, to use only that API Key. Associated API Key: Can be generated by another plugin, site, or imported, and stored in a custom table that is used by the WooCommerce API Manager when the API Key is associated with an API Resource. This allows store owners to use API Keys in a custom way. The WooCommerce API Manager has API Access Expiration, which is just another way of saying a time limit for an API Key that acts like a subscription. The customer buys a product, and can access that product (API Resource) until the API Access time limit expires, at which time the customer must renew the time limit by buying the product again. When the product is a WooCommerce Subscription, the store can automatically renew and bill the customer, or the customer can manually renew the subscription. A Variable WooCommerce Subscription allows a customer to upgrade/downgrade the subscription. All API Resources are managed using API Key activations. A product can have one or more activations available, and any of the API Key types mentioned above can be used to grant access to the API Resource. The choice to use the built in API Access Expiration, or WooCommerce Subscriptions, depends on the product, and store needs. Easy product API form for software and non-software products. URLs for the local server, Amazon S3, or remote, are wrapped for security and with an expiration time to prevent illicit use. 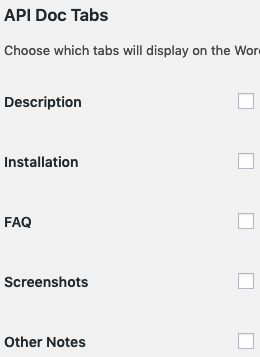 Plugin update tabs can be added or removed. Products that are not WooCommerce Subscription types can use the API Access Expires field to limit API Resource access just as a subscription would provide. Store owners can disable a customer’s API Access if needed. 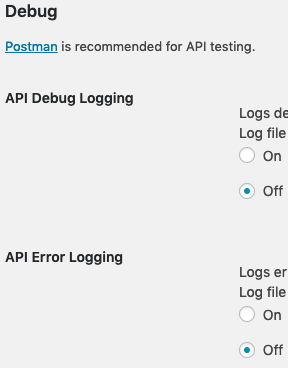 There are several options for beautifully formatted debugging data that is stored in custom WooCommerce logs. Expensive database queries can be cached to dramatically increase the speed of critical services such as the API responses, and minimize server load. If object caching is configured on the server, the speed boost will be even more dramatic. Cached database queries are also cleaned up automatically on demand to keep the server running optimally. Order items that are API Resources are listed on the Order screen along with pertinent details. API Key activations are listed on the order screen, and can be removed if needed. On the My Account > API Keys page the Master API Key is always listed. The remaining details can optionally list the Product Order API Key, or it can be hidden as is shown in this screenshot. The customer can remove activations that were not properly removed by client software in the dashboard. On the My Account > API Downloads page API Resources that are software products can be downloaded, and saved to Dropbox if that option is configured. All URLs are secure, and expire at a time interval configured under settings. The PHP Library maintained in the private Github repository for the API Manager makes it possible to setup both WordPress plugins and themes in minutes. This is an example. When the plugin is activated the customer can easily find the activation screen. Once activated the API returns the activation totals. The Product ID form field in the screenshot above is optional. When an update is available, the customer will see and update the plugin like any other WordPress plugin. Depending on the information gather, and tabs chosen in the settings, the plugin view details screen displays information as would be displayed for any plugin from wordpress.org, so it will look familiar to the customer. The ab – Apache HTTP server benchmarking tool was used to test the WooCommerce API Manager API Status function in three test cases. All tests were performed using an HTTPS connection which is much slower than an HTTP connection. 500 API requests with 10 request concurrency. 500 API request with 1 request concurrency. 500 API request with 100 request concurrency. SSD hard drive, that comes standard on DigitalOcean servers. This server is $15/month. The server used in the test is the live server at toddlahman.com, which has a large database of customers, so the test could reflect a real-world result. Response times for requests are measured in milliseconds. A millisecond is a thousandth of a second, or 0.001 seconds, so 0.001 seconds is 1 ms (millisecond). 500 requests with 10 requests concurrency. Time to complete test was 20 seconds. Mean time per request of 40.77 ms (milliseconds), which is 0.04 seconds. Mean requests per second 24.53, which is 1,471.8 per minute, or 88,308 per hour. The time factor depends greatly on the slowness of HTTPS encryption. 500 requests with 1 request concurrency. Time to complete test was 41 seconds. Mean time per request of 82 ms (milliseconds), which is 0.082 seconds. Mean requests per second 12.19, which is 731.4 per minute, or 43,884 per hour. 500 requests with 100 requests concurrency. Time to complete test was 21 seconds. Mean time per request of 42 ms (milliseconds), which is 0.042 seconds. Mean requests per second 23.58, which is 1,414.8 per minute, or 84,888 per hour. The WooCommerce API Manager performed extremely fast, and reliably under heavy loads without caching enabled. In fact, the WooCommerce API Manager performed better as the request load increased, and at a rate of between 43,884 to 88,308 requests per hour, or 12.19 to 24.53 requests per second. It is safe to say the WooCommerce API Manager can scale to meet the needs of the smallest to the largest WooCommerce store, but would perform even better with caching enabled. What is the difference between the WooCommerce API Manager and the WooCommerce Software Add-on? The WooCommerce API Manager works with almost any product type including Simple, Variable, Simple Subscription, Variable Subscription, and Group. The Software Add-on only works with Simple products. The WooCommerce API Manager has a private Github repository with a client software PHP Library that can be dropped into WordPress plugins and themes to connect a product to the API Manager instantly. The Software Add-on requires you to build your own. The WooCommerce API Manager allows download files to be served from Amazon S3. Software Add-on does not. The WooCommerce API Manager has built-in API Key expiration, and is fully compatible with WooCommerce Subscriptions. The Software Add-on has neither. 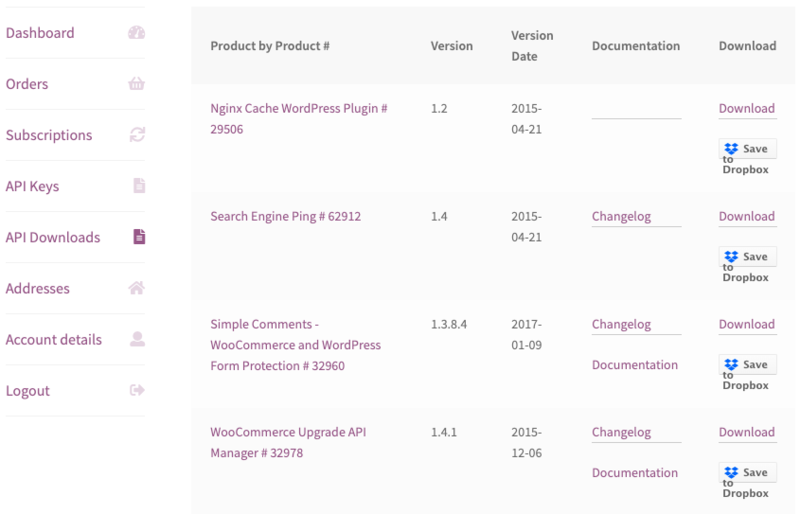 Take a look at the documentation for both the WooCommerce API Manager and the Software Add-on to see the many differences, and decide which is the better value going forward for your store. Download, install, and activate the WooCommerce API Manager in your WooCommerce store. Read our extensive documentation to get started on the right path. That’s it! Sit back and enjoy more revenue using API Keys to control API Resources for your site! Need any more reason to buy? When you purchase a Todd Lahman LLC developed extension, you’re getting the highest quality extensions for your WooCommerce store. Gain peace of mind by knowing that when you purchase our products, your store’s performance is as important to us as it is to you. In fact, we use our own products on our own WooCommerce store.